When days get shorter and autumn brings a distinct nip to the night air, there’s no denying the attraction of the iconic sand dunes of Maspalomas, the lively bars and restaurants of Playa del Inglés and the bridges and canals of Puerto Mogán in which to soak up Gran Canaria’s endless supply of sunshine. But when you’re all sunbathed and shopped out, head inland and north to discover a more natural side to the island. 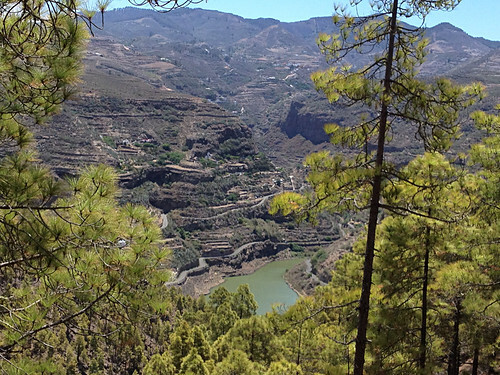 Climbing to its rural heart in Cruz de Tejeda you’ll see a face of Gran Canaria that will have you wondering if you haven’t accidentally slipped through some portal onto a different Canary Island. Layer after layer of mountain ranges extend to the horizon and the outline of Mount Teide on neighbouring Tenerife. In between the peaks lie glistening reservoirs embedded in deep valleys topped with thick pine forests and riddled with walking trails. 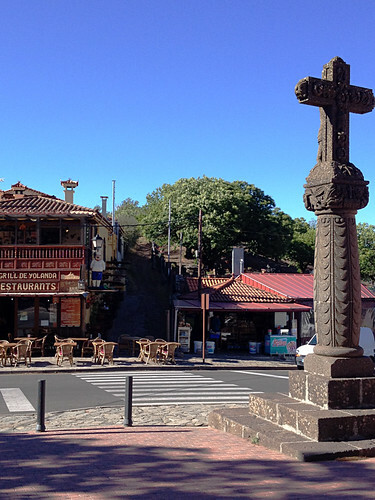 Alongside the cross from which Cruz de Tejeda gets its name you’ll find the rather splendid Parador with its pretty café terrace overlooking the spectacular landscape. 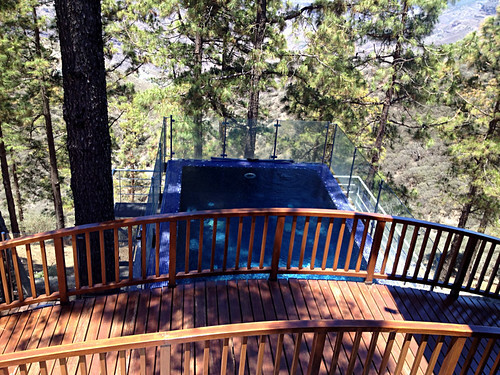 If you’re feeling flush, check in for a night and pamper yourself at their spa, including the swimming pool that juts out over the forest. Opposite the Parador you’ll find kiosks, souvenir shops and the lively Grill de Yolanda which serves good food at reasonable prices and is a popular bikers’ spot on weekend evenings. To the right hand side of Yolanda a shady path leads up into the hills that will take you, in an hour and a half, on a beautiful walk through dappled forest and across emerald fields with stunning views over the valley, to the pretty little town of Tejeda with its museums, restaurants, craft shops and a small bakery specialising in almond cakes that people travel from all over the island to buy. 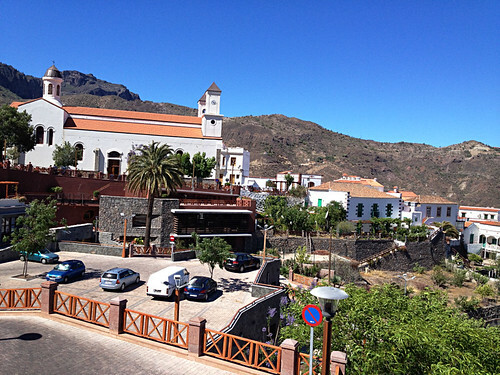 Continue your journey down through the pretty hamlet of Santa Brigida and follow signs to the Caldera de Bandama where you’ll find the site of Gran Canaria’s last volcanic eruption. Parking the car at the top of the entrance to the crater, a half hour walk down the steep path, through palm groves and scented broom takes you to the bottom of this natural phenomenon where you’ll find the ruins of an estate which once sat at the centre of its own, extensive vineyards. Look up at the cliff walls high above you and you’ll see caves which, 500 years ago, are where some of Gran Canaria’s original inhabitants lived. So next time you have the urge to go natural in Gran Canaria, avoid getting the white bits pink and opt to go green instead – it certainly won’t leave you feeling blue. 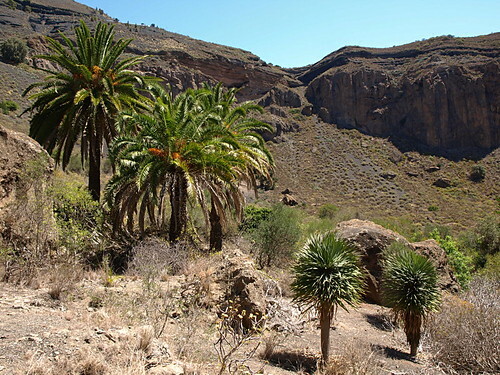 If you fancy getting to know the island’s walking trails, check out the Gran Canaria Walking Festival which is happening between 15th and 22nd September 2012.